Somehow i wish that i could just help all the girls and guys who suffer from ED's.... but it really isnt that easy. I can sit here and tell people that you have to stay strong, that recovering is hard, but it is worth it. And it really is... i am not lying about that. But really, what do my words do? Not much. Unless you yourself decide you want to get better...? But what i hate most is society... society telling us that we are never alright. There is always something wrong with us. We're either too fat or too skinny. Ugly. Unperfect. Not smart enough. We're either too lazy, or obsessively active. We are never ok.... according to society, that is. But we need to realise that why are we trying to please society, trying to please others? 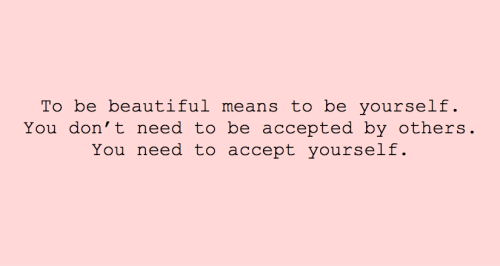 We should just love ourselves, accept ourselves. Its our bodies, its our minds. We should do think things, which makes ourselves happy, which makes us feel good. One thing which makes me very angry is thinspo.... and pro-ana /pro-mia. I have recently reported a few pro ana blogs.... i get very angry over it. I wish they were illegal. Anorexia and ED's are a huge problem. And the fact is, girls and boys as young as 8 - 10 have already started dieting, or are diagnosed with anorexia...? It makes me so sad to know this. To know that kids, children, that is what they are, have an eating disorder. A mental disorder that kills if left untreated. When you have an ED, you are missing out on life, and when you are sick you dont really care about that.... but when you recover, if you ever do... its then you regret all the bad choices you made when you were sick. ALl the years you wasted. All the parties and nights out. The trips with your friends. The sleep overs & or movie nights... or just fun things in general which you didnt go to, or werent allowed to go to.... you're missing out on life and memories. If someone hasnt had an ED, it is impossible to understand what you go through. The anxiety, the panic... and the fear of food and gaining weight. It is true and utter fear of gaining weight. And it is hard to explain it. I have one clear memory, which i dont think i will ever forget, and it doesnt help that it is written down in my journals from when i was in hospital (which i have). I wish i could go back in time and tell the 12 year old me, to not start skipping lunch. To not start cutting out dinner. To just keep eating.... :/ But i guess what ive been through has made me who i am now. And i dont think i would change my past, even if i got the chance. No one should have to suffer.... Recovering from anything is hard, whether its drug abuse, or an alcoholic, or recovering from an ED... they are all hard, and it takes time and can involve relapses... but you cant give up. That is the most important. 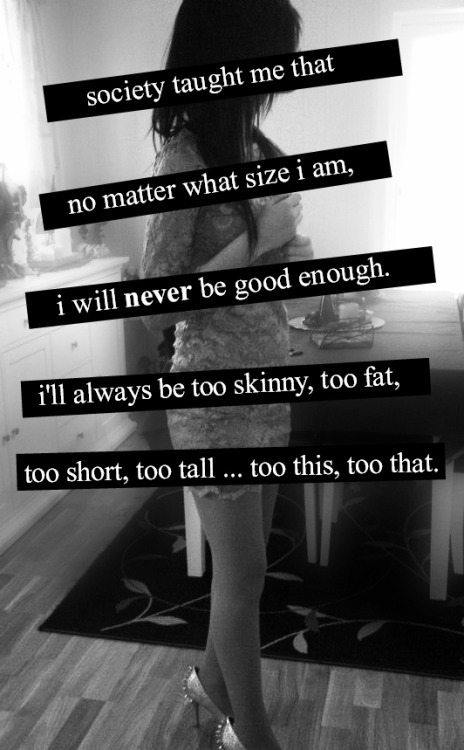 I wish i could get rid of all thinspo..... i get so angry about it. I know that whoever makes these thinspo/pro-ana pages is sick, and is so deep into their illness, that they dont see the 'negative with it' theyj ust want to lose weight, and be so skinny....? But i mean, young girls and guys see these sites/pictures and think that they have to be size 0 (even smaller?) to be perfect? And that is not true. We are all beautiful the way we are. 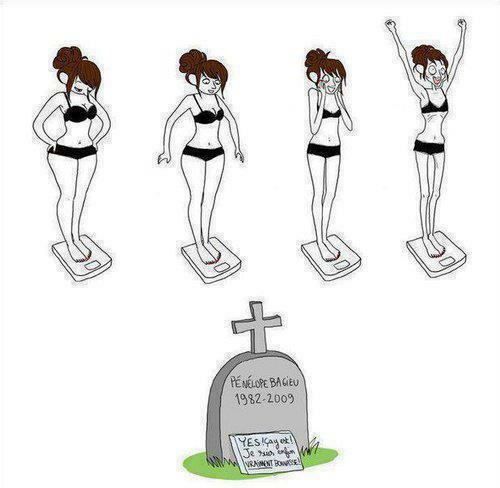 But it doesnt help that society and media keeps telling us, ways to diet. Way to lose 5kg. Dont eat carbs. Dont eat fat. etc etc. I dont even know what to write now... or i have loads to write. But im so tire,d that i cant seem to form the sentences, or get the words out of my head... so im just gonna have to end the post here.... really, i dont even know what it is ive written. I feel your frustration too Izzy. I will admit i am sometimes lured in by thinspo. Society puts so much pressure on everyone - and those of us who are more sensitive cannot brush it off so easily. I try to focus on myself and be me. Thats all we can really do to try to block out any negative pressure from outside sources. I would be terrified to have a child growing up in this world right now - how could you protect them? I suppose all you can do is try to raise them to be strong. people don't realize that thinspo is just as bad for anorexics and those with other ed's, just like how passing by a bar on the way home from work is to an alcoholic. Thinspo distracts recovorers rfrom becoming fully recovered! People need to see that eating disorders are bad, just like alcoholism,and shouldn't be praised or drooled over! I totally agree with what you say, and I'm also very angry against society. This world where you always have to be richer, healthier, better, smarter, .... how couldn't we want to become perfect in a such crazy world?!! Anyway, how do you do to stay positive knowing all this? Because I really want to finally be free of ED's, but sometime a little voice in my head whisper "but, what's the purpose to heal? you'll still be on a planet where humans are slowly destroying everything, so why should I stop destroying myself? Sorry if this question seems a bit too harsch , but even if I believe in my recovery, sometimes I'm really scared of what's gonna happen in the future... was just wondering if you already asked yourself those questions?